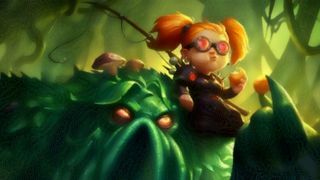 Hearthstone is adding a new hero for Warlocks this Halloween - a gnome by the name of Nemsy Necrofizzle - and all you need to do to get her is play some Hearthstone while you relax and kick up your feet by the (virtual) fire. That's not a euphemism or metaphor, by the way. In order to get Nemsy added to your collection, you'll need to participate in what Blizzard calls a 'Fireside Gathering' starting October 17. Fireside Gatherings were introduced to the Hearthstone community a few years back, but they've become more prominent as of late thanks to in-game support. Basically, they're casual social events and mini-tournaments organized by players that take place in public spaces rather than the lavish, multi-million dollar prize pool extravanganzas hosted by Blizzard. Fireside Gatherings must be open to the public and held in a public space. Blizzard makes mention of "spooky swag boxes" that hosts can request (if said host is over 18 years old) but there's no details on what said box would contain. As for Nemsy, you'll only be able to unlock her if your Fireside Gathering is held by an established Tavern (an open community similar to a clan which hosts regular events) so making a bunch of accounts for yourself won't work. You'll also need to participate in a Fireside Brawl (an in-game option that gives a match between players new rules) so no skimping the gameplay part of this equation. You can check to see if there's a Fireside Gathering Tavern near you on FiresideGatherings.com, and make plans to attend from there.